Written and directed by two veteran documentary filmmakers Aron Gaudet and Gita Pullapilly (a husband-wife team), Beneath The Harvest Sky is a coming-of-age story about two teenage best friends (Emory Cohen and Callan McAuliffe) in a small, potato-farming town in Maine. They both dream of escaping to the big city. Yet, their choices take them on tragically different paths as they try to pursue their goals. PHOTO CREDIT: Movie still featuring Emory Cohen and Callan McAuliffe - photo from the movie’s official website. 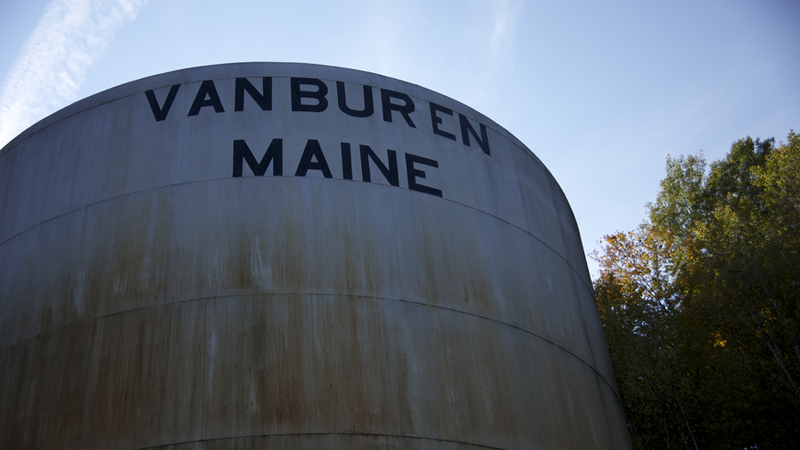 Beneath The Harvest Sky was set and filmed entirely in Van Buren, Maine. When asked why they decided to film the movie in Van Buren, Gaudet said that he and Pullapilly were at first drawn to the region through a series of photographs centering around the potato harvest in Northern Maine. 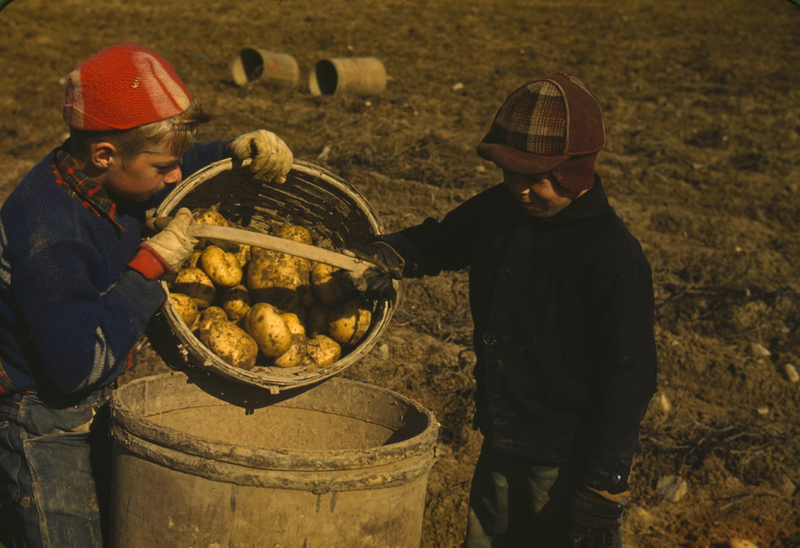 PHOTO CREDIT: A vintage photograph of children gathering potatoes on a farm near Caribou, Aroostook County, Maine. Photographer: Jack Delano. Haunted by those images, the filmmakers decided to scout for locations in and around Maine’s Aroostook County. As they were driving through the many small towns in the area, “Van Buren kinda jumped out” at them. It was pretty much love at first sight. PHOTO CREDIT: Movie still featuring the Van Buren water tower - photo from the movie’s official website. The filmmakers even took a step further and made Van Buren their home during the pre-production and filming of Beneath the Harvest Sky. They moved to Maine. Gaudet and Pullapilly weren’t the only ones. The two young actors Cohen (a New Yorker) and McAuliffe (an Australian) also arrived into Van Buren a few weeks ahead of the film’s shooting schedule. They wanted to get to know the town where their fictional characters live on a more intimate level. PHOTO CREDIT: Van Buren’s Main Street (Route 1) - photo is from here. In addition to looking the part, Van Buren’s statistics also match what the filmmakers had in mind for the movie’s setting when they wrote the screenplay. They wanted the location to be in a town near the Canadian border, with one school, and many potato farms (in Northern Maine, some towns are more mill towns than farming towns). Van Buren has all of the above. PHOTO CREDIT: Behind-the-scene photo of the crew shooting a potato harvest scene in a LaJoie potato field - photo from the movie’s official website. Beneath the Harvest Sky highlights the diversity of location choices available in Maine, and that diversity is something the Maine Film Office has been working to introduce to filmmakers. Maine is most known for the lighthouses and coastal communities that line our coastline. We have some of the most unique and authentic coastal locations in New England. As you venture inland, Maine also has so many geographically diverse locations and beautiful landscapes that have a rich cinematic look, which makes Maine an attractive location choice. Beneath the Harvest Sky reveals a look at the inland communities that people may not be aware exists beyond Maine’s coastline. With their motto being “authenticity above all else,” it’s no surprise that the filmmakers chose to set and film Beneath The Harvest Sky, their first feature film together, in Northern Maine. The locations used in the movie were spread out all over Aroostook County. Through the expertise and lens of cinematographer Steve Calitri, Gaudet and Pullapilly were able to showcase Maine in a visually stunning way. The state’s idylic countryside, potato farm fields, and even abandoned quarries, provide a truly beautiful backdrop for Beneath The Harvest Sky. PHOTO CREDIT: Behind-the-scene photo of DP Steve Calitri and Co-Director Aron Gaudet discussing a shot - photo from the movie’s official website. In addition to all the above perks, the filmmakers were also in awe of the “free community support” they received during the making of Beneath The Harvest Sky. They had an abundance of support from the farm family in Van Buren, specifically from the LaJoie family. That was basically how they were able to pull off some of the incredible scenes in the movie under very limited budget. PHOTO CREDIT: Behind-the-scene photo of the crew filming a scene with Callan McAuliffe inside the Van Buren school - photo from the movie’s official website. PHOTO CREDIT: Behind-the-scene photo of Jay LaJoie and Gil LaJoie on their farm during the film’s first day of production - photo from the movie’s official website. In addition to the generous assistance from the LaJoie family and the Van Buren community, a business partnership with Terra Chips (brilliantly devised with a team from the Harvard Business School) also came in handy to help finance the film. Gaudet and Pullapilly’s passion and hard work have paid off handsomely so far. In addition to the movie being picked up for national distribution by Tribeca Films last December, the talented duo have also recently made Variety‘s 10 Directors to Watch list. PHOTO CREDIT: Above photo of Aron Gaudet and Gita Pullapilly, directors of Beneath The Harvest Sky, is from here. Beneath The Harvest Sky will be in theaters nationwide later this year. The movie also has an official Facebook page. A new wage-tax rebate plan. A new income tax rebate for investors in media projects. No state sales taxes on most production items. Reimbursement on lodging taxes for long-term stays. No state sales tax on purchases of most fuel and electricity for productions. For more details and information on filming in Maine, visit the Maine Film Office’s website. PHOTO CREDIT: Above photo of a potato field in Presque Isle, Maine is from LocationsHub.com. Beneath The Harvest Sky is now screening in selected U.S. theaters, on Amazon Prime, and iTunes. We also found out that Peter Paton and Scott Anthony Smith, two of our favorite Maine actors, are also in the movie. Hope you'll get to see the film soon!